Blood worm (Chironomidae [Ky-ro-nomi-day] tetans) is the larvae of the midge fly. It is a small (3 cm [1.2"]), long, thin, bright red larvae which grows in stagnant pools. The blood worm has red iron-porphyrin protein in its blood and tissue which gives it its characteristic colour. This larva is very important in the wild aquatic food chain. Therefore, it is one of the primary live foods fed to virtually all aquarium kept freshwater aquatic animals. All aquatic animals (fish, frogs, shrimp, snails, etc.) seem to like this food. It is very readily taken. 6-8% protein and iron rich. However, it doesn't have a wide range of amino acids, so do not feed as a primary food supply. Give it as a treat once or twice per week. Not recommended as a single source of food due to its very low protein levels. Blood worms, vitamins (ascorbic acid, beta carotene, biotin, hydroxocobalamin [source of vitamin B12], niacin, riboflavin, thiamine HCL), amino acids (methionine [dl-methionine], l-lysine, taurine), and trace elements (calcium chloride, potassium iodide, ferrous sulfate, manganese sulfate, magnesium carbonate, zinc sulphate). It's available from the vast majority of aquatic stores or bait shops. Available as live food in sealed plastic bags from pet and fish shops. Some aquarists wash this food with tap water using a fine tea strainer or coffee filter. When using in this form, try to filter out as much of the water the blood worm is kept in as you can. This is recommended due to the possibility of the water being diseased. Available in frozen cube format in the freezer section of a pet or fish shop. Easy and convenient to use, as it comes in tin foil sheets. 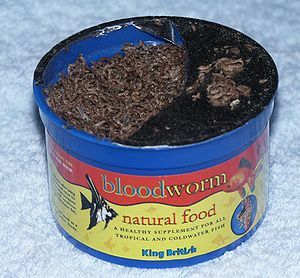 Do not keep frozen blood worm in the freezer for more than 6 months or it will go bad. Available as dried food packaged in small tubs. Please note that this form tends to be the least nutritional. Plus as you use it up you'll find it turning to dust as you get near the bottom of the tub. This food is only suitable for top feeders as it is nearly impossible for it to sink. So it is not suitable for Dwarf African Frogs. It also comes with an allergy warning, amusingly enough. Tetra sells this in a jelly form in small 3g sachets. Has extra vitamins added to the gel. There have been medical reports that people can develop an allergy to this creature over time (takes 1 – 2 years) just by touching it, breathing in dried blood worm dust or its contaminated water. A bad reaction (itchy or swollen eyes, coughing, shortness of breath, skin swells) to this fish food can build up over several years and you should be aware of this. As with giving your animals any live food, there is the risk of adding parasites and diseases to your tank. 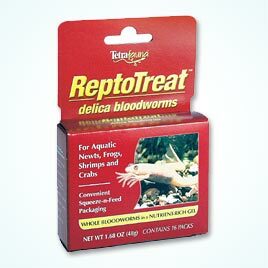 Frozen, jellied and dried bloodworm is usually irradiated to remove these dangers. But check the packaging. 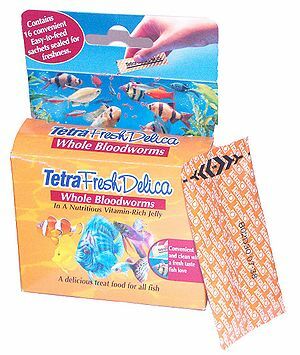 With some low quality frozen bloodworm the suppliers will add in their ingredient list extra vitamins so the food looks more nutritious. This can be a sales gimmick rather than any benefit to your fish. These vitamins are usually added in the water they are frozen with and these will break down in minutes when exposed to the aquarium. You can often tell if your supplier does this by examining the ingredients list. If the list has the vitamins in brackets i.e. 'Blood worms (vitamin B12, C)' then these are inside the worm. If the items are listed after the blood worm with a comma then they're in the water. This page was last edited on 21 November 2018, at 15:02.